Christos Tsitsaros: Cahier Tango, Sonata, Four Concert Transcriptions of American Songs. 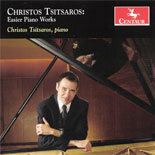 New original piano works by Christos Tsitsaros. Centaur Records, Inc.
Recuerdos de Taos, Two Night Pieces, Dramatic Variations after a Reading of Primo Levi’s Survival at Auschwitz. 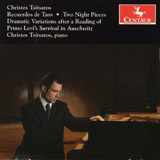 An album of original piano music by Christos Tsitsaros. 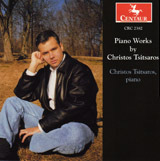 Centaur Records, Inc. (CRC 2856, 2007) Piano Works by Christos Tsitsaros. An album of original music featuring Blackbirds at Ueno, Autumn Sketches, Nine Tales, Cyprian Fantasy, and Echoes from an Arena. Centaur Records, Inc.